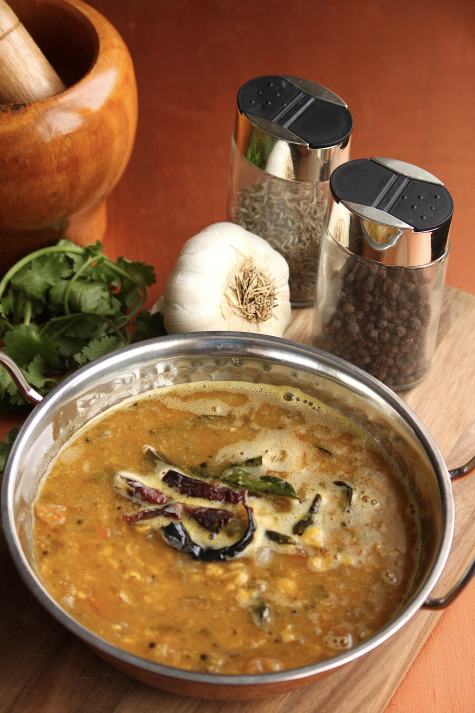 There are several ways of making rasam; with crushed spices, with tomatoes, with dal etc. Rasam is a thin watery gravy poured over rice and enjoyed with it. It is packed with flavors; spicy and tangy. I made the rasam in the Instant pot and added chana dal to it. This is a thicker version due to the addition of chana dal. Crushed black peppercorns, cumin seeds, and garlic along with other spices are added that will make this rasam aromatic and flavorful. This can be served as a soup as well, or serve with rice. In a mortar and pestle or in a food processor; coarsely crush peppercorns, cumin seeds and garlic, keep aside. Soak tamarind in ½ cup water for 5 minutes. Squeeze the tamarind in water, strain the juice and discard the skin. Rinse chana dal under running water. No need to soak the dal. Into the stainless pot, add all the ingredients 'for cooking' along with the crushed spices. Select pressure cook mode, high pressure, set time to 20 minutes. After 20 minutes, do a quick pressure release. Using a hand blender coarsely blend the mixture. Or grind in a blender, make sure to grind coarsely. Place a frying pan over medium heat, add ghee. To the ghee, add mustard seeds, let splutter. Add urad dal, saute for a few seconds. Add dried red chilies, turmeric powder, asafoetida, and curry leaves. Saute for 5 seconds. Pour the mixture over the cooked rasam. Combine well. 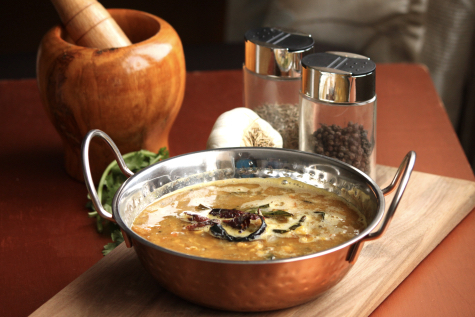 Ladle the dal rasam into a bowl. Serve as a soup or with rice. Enjoy this spicy and tangy rasam, perfect for winter. You can replace chana dal with toor dal.